Maurice D. Hinson, MD - Does The Truth Matter? Dr. Maurice D. Hinson, Resident Physician in Internal Medicine at New York - Presbyterian Hospital was the Keynote Speaker at the UMF 14th Annual Scholarship Awards Ceremony. He was passionate about his journey and equally passionate about possibilities for the future through his "young brothers and sisters"
The native Philadelphian, member of the first UMF cohort in 2004 to receive a scholarship, and 2015 graduate of Drexel University College of medicine, returned home to address the UMF scholars, families and friends. He gave a stirring mix of history lesson - "Black is beautiful", "Black is Brilliant", and motivational charge to the students to respond to the "state of emergency for black people" by regaining and keeping confidence in their self worth. "You are the Truth , and your lives absolutely matters", he said. The District Attorney for the City and County of Philadelphia, R. Seth Williams, was the keynote speaker and inspiration for the annual ceremony honoring UMF scholars in 2016. Citing his challenging struggles growing up in Philadelphia but with determination to succeed "in spite of", Mr. Williams spoke of how our struggles make us stronger. He encouraged students and family/friends to continue on and be encouraged that it is possible to be the success you want to be. We first give a big Thank You! Thank you to He who made it possible during these thirteen years for us to fund and operate the Urquhart Memorial Foundation. We thank Him for enabling us to annually award scholarships that encourage and enable so many to go to college, and return to say thank you as they go about making a difference in the world. Generous benefactors, we thank you for your support of the work of the UMF and specifically the over six hundred students who have started and in most cases finished their educational journey with your help. In the midst of today's national and international political chaos, economic uncertainty, social disarray/dismay, and global insanity of hate and violence we're happy to be part of a few moments of clarity, support, and hope. This year the UMF awards thirty-five scholarships to deserving students who will attend Pennsylvania Colleges/Universities. We encourage, hope, and pray that these scholars will return your investment in them tenfold with career contributions that will make you/us proud. Good Luck and God's speed to all benefactors, and beneficiaries of the Urquhart memorial Foundation. We are thankfully proud of all of you. Deputy Commissioner Yolanda Stallings Speaks - "GRIT"
Executive Chief Yolanda Stallings, a 14 - year veteran of the Philadelphia Fire Department, was appointed in June 2014 as a Deputy Commissioner with the title of Executive Chief of Strategic Services. She is the first African American female to serve on the PFD Executive team as a high ranking official. Chief Stallings has been afforded the opportunity to serve in this prestigious position as Executive Chief for her due diligence and avid passion for education and trying, as well as her dedication and commitment to both the community and the Philadelphia fire Department. 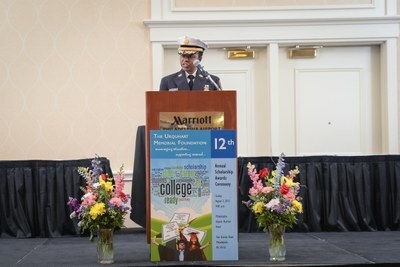 Chief Stallings brings diversity and an impressive knowledge base to the organization. Under her command are the Philadelphia Fire/EMS training Academy, Health and Safety Office and the Office of performance and Accountability. She is credited with building one of the most successful Career and Technical Education programs in the City of Philadelphia. Chief Stalling gave an outstanding and inspiring speech about "GRIT" (resilience and determination) in her personal experience of getting an education and working your passion. She offered pointers for both students and supporters to remain determined in pursuing their passion in life with Grit. At a time when the world is challenged by a confluence of transitions and tragedy we are encouraged and emboldened to envision better days ahead in part because of another class of UMF scholars who start or finished their educational journey in 2015. This year we have seen the approval and implementation of public policy and laws that result in major shifts in culture and society. Unfortunately, some of these geopolitical shifts have led to major tragedies of hate, and violence nationally and globally. However we believe that change, transitions, and even tragedies of today create new challenges and opportunities for our leaders of tomorrow. We are optimistic and hopeful that those we support today, (such as the fifty–two UMF scholars) will rise to embrace skills, competencies, and compassion that will successfully navigate the city, nation and world to future success. This year we particularly recognize and highlight scholars who not only started with UMF but also completed their chosen baccalaureate program (s) and enrolled in a graduate degree program and/or careers in their chosen field . Additionally, we extend a special “Thank You” to UMF donors and supporters who consistently and generously give to encourage education. Good Luck and God’s speed scholars. Thank you friends and supporters. The UMF Board of Directors met on August 1, 2015 in Philadelphia. As part of it's annual review of UMF operations and outcome the Board affirmed its commitment and support of the Founders vision for the future of the organization and its goals and objectives. + Approval of the Financial Report which included the very positive financial, and growing status of the Foundation. + Update on upgraded marketing and donor cultivation plans implemented since 2014 Board meeting. + Agreement to raise minimum GPA to 2.5 for scholarship consideration. The UMF is committed to encourage education primarily through "start-up scholarship". And in addition to helping scholars start we are inspired and encourage them to finish. Success stories about the finish are stories worth telling. On Friday May 15, 2015 Michelle and I attended the graduation of Maurice D. Hinson from the Drexel University School of Medicine. The ceremonies were held at the Kimmel Center for the Performing Arts, Philadelphia, PA.
Eleven years ago (2004) Maurice participated in the first UMF Scholarship Awards ceremony where he received a special scholarship award from Ernie & Michelle Urquhart to start his educational journey and to achieve this major milestone with his Doctor of Medicine degree. He also received the Maurice C. Clifford, M.D. Leadership Award for his work creating the Drexel University College of Medicine Mentoring and Pipeline Program (DMAPP). DMAPP is designed to increase opportunities for and advance the health and well being of teens in an underserved Philadelphia community. During his 3rd year Maurice was the recipient of the 2014 Excellence in Public Health Award from the United States Public Health Service for his work to achieve health equity, to eliminate health disparities, and to improve the health of all groups. The Urquhart Memorial Foundation salutes Dr. Hinson, and other UMF scholars, who launched their college education journey with UMF scholarships (and other support) to not only start but also successfully complete their educational pursuits. And, they now participate in flourishing careers that will benefit their communities, family, and themselves. Success stories such as these inspire us to continue to do the mission of the UMF. Your supporting contributions make it possible. We encourage and appreciate your donations. On March 28, 2015 UMF co-Founder Ernie Urquhart celebrated his milestone birthday with wife Michelle and over 100 friends and family from across the country at a gala benefit for the Urquhart Memorial Foundation, held in Scottsdale AZ. Celebrating the blessings of 65 years of life and 10 years cancer-free Ernie used the celebration opportunity to also celebrate the benefactors and beneficiaries of the UMF. Donations to the Foundation totaled nearly $12,000 as guests showed their love for Ernie and support for the Urquhart Memorial Foundation with their presence and giving. Three days after the big event the UMF scholarship application submission process ended. Over fifty applications were received and are being processed for decisions to be communicated to applicants no later than May 15, 2015. The 12th Annual Urquhart Memorial Foundation Scholarship Awards Ceremony will be held on Sunday August 2, 2015 at the Philadelphia Airport Marriott Grand Ballroom at 4:00 pm. The donation gifts received in honor of Ernie, and all other donations, to the UMF will go along way toward making it possible to award many UMF scholarship awards in August to deserving students. This quote by this contemporary entertainer and businessman seems an appropriate message for and about the UMF Scholars of 2013. These forty –four students are attending Pennsylvania colleges and universities preparing to fly. Their flight plans include gaining knowledge and expertise for a career in Medicine, Education, Business, Engineering, and the Arts, to name a few. Wherever they land, according to their flight plans we pray that they will successfully make a big impact in the community and global society that they will serve. We extend warm congratulations and support of the Urquhart Memorial Foundation consistent with our Mission. We join with family, friends and other supporters who share our vision that UMF scholars can and will fly in part because somebody helped to launch them.